ITSC modeling, simulation and analysis researchers used Probabilistic Design Analysis to perform risk analyses of the Ares I launch spacecraft design. Probabilistic design analysis (PDA) is a methodology to assess component reliability for given failure modes in complex systems. PDA involves the modeling of the probability of integrated system failures which then can be used to focus design improvements for improved operational safety. UAH supported Jacobs Engineering and NASA through the exercising of PDA in the design of the new Ares I spacecraft. The work involved investigating of upper stage engine failure modes and their impact on surrounding engine and upper stage elements. A failure mode, for example, could be a hot gas leak in the engine. The PDA analysis would involve the modeling of the hot gas physics as well as identifying the resultant system components impacted by the hot gas. Then the affected system components would be modeled to determine the resultant operational response to the additional heat imparted by the hot gas stream. Each failure has the potential to cascade additional operational impacts. Determining the probability of these cascading failures and therefore the potential operational impacts is the essence of the PDA analysis. Key areas of concern would then generate additional design considerations while other areas may be proven to have limited potential for cascading critical events and would be removed from redesign consideration. UAH has developed a "source and target" model as the fundamental framework for the PDA analysis. 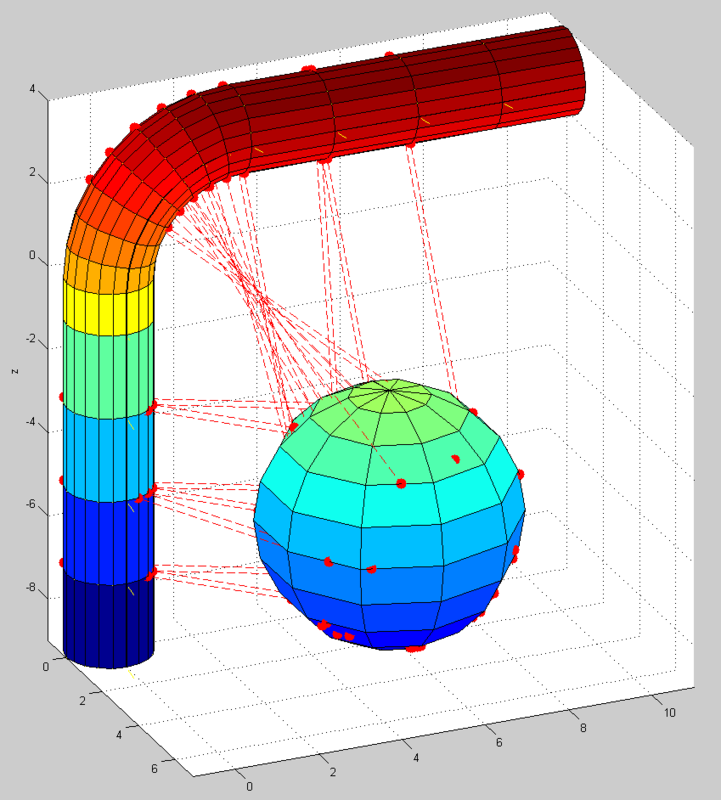 This model, developed in MATLAB™, allows the stepping across small predefined elements of an assumed failed part and automatically assessing the surrounding space for intersections of the failure source with surrounding elements. Each intersection with a target then allows an analysis of cascading failures based on the target component's material properties and operational parameters. The PDA framework of sources and targets will allow expanding of the PDA analysis beyond this initial engine study. Geometry data are read into the MATLAB™ code directly from CAD files and therefore additional failure sources and targets could be any Ares I elements for which the CAD data are available. The additional challenge for each failure analysis will be the accurate modeling of the unique failure physics and cascading system failures. PDA simulations will include the computations of the probabilities of a critical failure occurring, the failure propagating to any other component, and subsequent component failure with the associated collection of time-based parametric data. This will include Monte Carlo analyses over both fundamental (natural) and assumption based uncertainties. As the studies progress, further primary component failures will be continually reviewed for additional investigation. The resultant collection of key failure modes and secondary effects will provide an integrated review of the Ares I operational environment and guide critical design improvements.